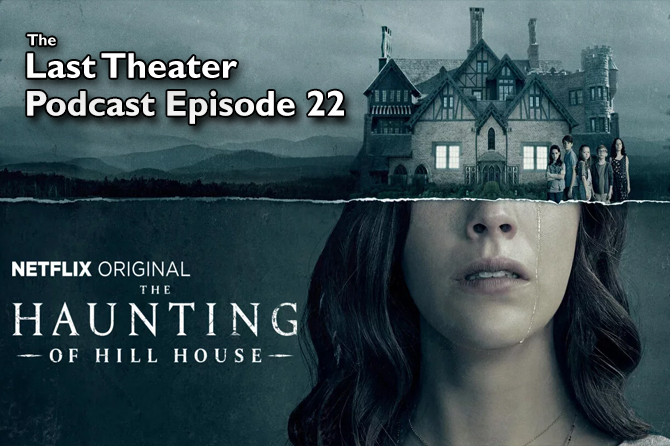 As a general rule for slasher movie sequels, the plan seems to always be to go bigger and provide more than what was seen in the previous movie. More deaths, more characters in which to provide those deaths, and more locations so those deaths can be more elaborate. Child’s Play 2 follows that plan to the letter, but as is usually the case, more does not necessarily equal better. Child’s Play 2 doesn’t come close to living up to the standard set by the first movie in the series, but even so, it’s still a pretty decent slasher movie that amounts to about an hour and a half of mindless fun. Child’s Play 2 takes place two years after the events of the first movie. Andy Barclay has been in foster care ever since his mother Karen was put in a mental hospital for supporting his claim that his doll had come to life and was responsible for multiple murders. 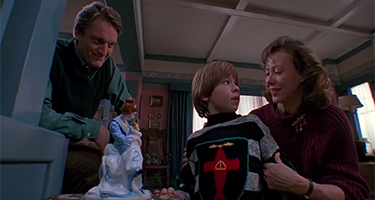 At the beginning of the movie, Andy is taken in by foster parents Phil and Joanne. Phil has serious reservations about taking in a child who he thinks has dangerous mental problems, but Joanne gives Andy the benefit of the doubt and convinces her husband that they can help and support Andy. Phil and Joanne are also fostering another troubled youth, Kyle, a seventeen year old girl going through a modest rebellious phase marked by cigarette smoking and sneaking out of the house at night. Phil and Joanne explain the house rules to Andy. Unbeknownst to Andy, the Play Pals toy company is rebuilding Chucky from his charred and dismembered remains. The reason they’re salvaging Chucky’s actual remains rather than making a new doll is a little sketchy, but it has something to do with a misguided attempt at improving public relations by showing that the doll, which is now infamously associated with murder, has nothing wrong with it. Of course, things go wrong immediately, and people start dying even before Chucky is fully awake. Once Chucky does realize he’s back, he begins to stalk Andy in his continuing attempt to transfer his soul into Andy’s body. One very obvious thing that sets Child’s Play 2 apart from its predecessor is its tone. 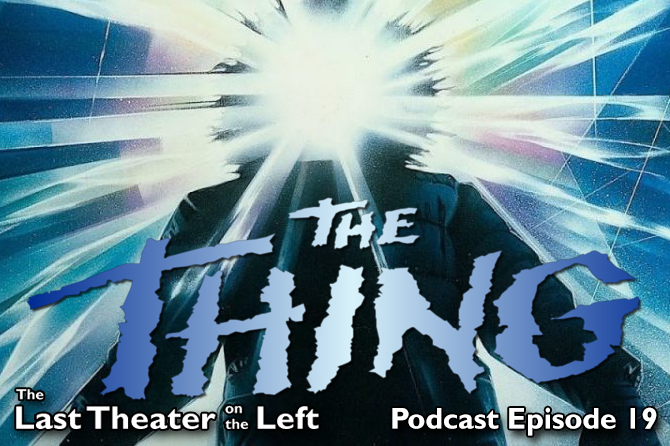 The first movie felt grounded in reality, but everything in this one feels larger than life. 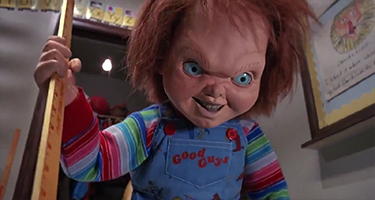 The sets are all huge and colorful, Chucky seems to take more joy in killing for the sake of killing, and the movie’s direction draws attention to itself for being pretty dramatic at times. While Child’s Play feels original and is a standout in the slasher genre, Childs Play 2 feels more generic in its approach. It doesn’t do a lot to stand out from the crowd of nearly comical slashers that were coming out around the same time period. New locations, new weapons, new deaths. Child’s Play 2 falls into the trap that many other slashers from the era did by featuring a wise-cracking killer who murders meaningless characters in inventive ways. That’s great if that’s what you enjoy watching, and I do enjoy mindless slashers, but it’s such a departure from the first movie that I can’t help but be a little disappointed. 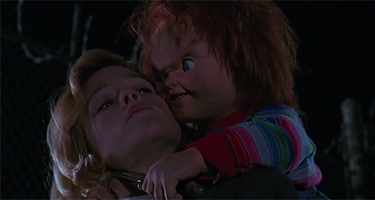 Most of the characters Chucky kills are very obviously created for the sole purpose of getting murdered. They mean absolutely nothing to the story and are simply forgotten after their scene is over. They’re mostly designed to be unlikable characters as well, which guides the viewer to cheer Chucky on rather than to get nervous at his presence. This movie signals the start down the path that all slasher series seem to inevitably follow where the villain, in a way, becomes the hero of the franchise. Whether that’s good or bad is debatable and is different for differing tastes. I personally think it’s fine, but I definitely prefer the tone of the original Child’s Play. As generic of a slasher as it is at times, I do like Child’s Play 2 as a sequel. Though the reasons for bringing Chucky back to life are thin, I like that it continues the story of Chucky trying to find Andy so he can transfer his soul back into a real body. There’s a scene near the end of this one that’s a callback to the first scene of the first movie, so as a sequel it feels like good closure to the story so far. I also like the character of Kyle and her relationship with Andy. Andy is only two years older than he was in the first movie, but he feels a lot older than that, and his relationship with Kyle has a nice big sister/little brother dynamic to it. It feels natural, and it’s a nice change from the mother/son relationship he had in Child’s Play. Kyle goes to great lengths to help Andy. Also, I’d be remiss if I didn’t Brad Dourif’s performance. Once again, he elevates Chucky from a gimmicky slasher villain to an iconic character. There’s a lot less rage and a lot more delight in his performance this time, so Chucky isn’t nearly as frightening, but that fits perfectly with the tone of the movie as a whole. Child’s Play 2 isn’t really meant to be frightening, it’s meant to be fun. For that reason, the fun-factor, I think Child’s Play 2 succeeds in what it sets out to do. 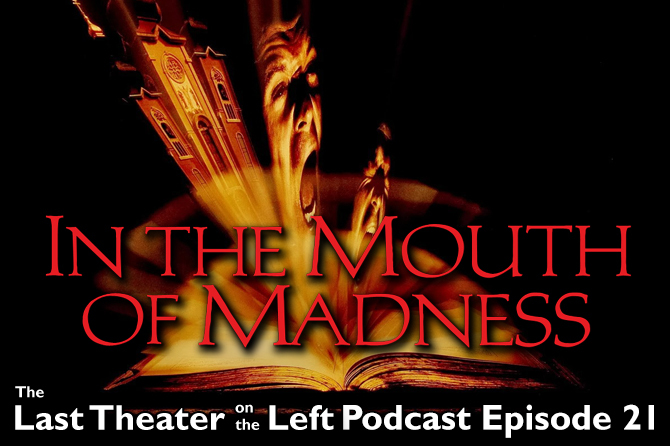 It is pretty mindless (there are too many coincidences and the logic of the plot falls apart if it’s given more than a cursory look), but most slasher fans will enjoy it if they don’t think about it too hard. And if you’re a slasher fan, then you’re probably already conditioned to give a lot of leeway to plot logic. Do yourself a favor though, don’t watch Child’s Play and Child’s Play 2 back to back. Doing that only makes part two feel like a bit of a letdown in comparison. Child’s Play 2 is silly, dumb, and slightly generic, but it’s a fun slasher movie with a story that’s a decent followup to the original. 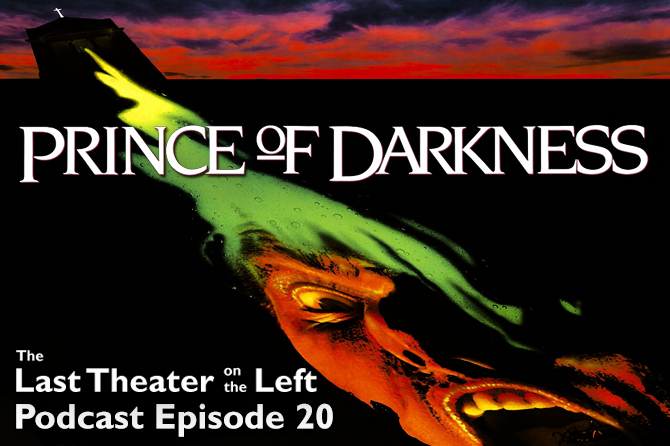 The tone is completely different than the first Child’s Play, and that can be disappointing, but if you like a fun villain killing people in inventive ways, then you can do a lot worse than Child’s Play 2. Halloween II is one of my favorite horror sequels of all time. Like Child’s Play 2, it follows up a tense and scary thriller with more death scenes, more elaborate kills, and a bigger focus on the killer. The tone in Halloween II is much different than the first movie, and it starts the series on the path of making Michael Myers the focal point rather than a mysterious presence. I enjoy it for what it is, a fun slasher movie full of bloody action. Watch the trailer for Child’s Play 2.